Shake with ice and strain into a coupe glass. Garnish with a lemon twist. Two Sundays ago, we decided to pay a visit to Tavern Road which just opened up a few days prior. Tavern Road and Blue Dragon both recently joined the Fort Point neighborhood to keep Drink company, and soon Trillium Brew Pub will be added to that list. For a first drink, I asked bartender Will for the Fishnets & Fangs which was created by bar manager Ryan McGrale. The Fishnets & Fangs like Ryan's Bittah Walshie is bitters heavy, but this time instead of Angostura he reached for Peychaud's. While the large amount of Peychaud's made me think of the Gunshop Fizz and its descendents like the Ran Duan's Antoine's Demise, the bitters, citrus, and raspberry combination reminded me of Ezra Star's Little Red Lion. I do regret not asking Ryan if the vampy name was somehow a tribute to the rebirth of the ManRay night club in Central Square. The lemon twist added to the berry-citrus aroma. The raspberry and lime continued on into the sip, and this was followed by the mezcal and the Peychaud's bitter flavors. 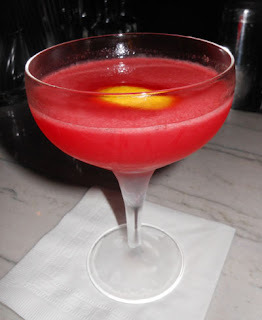 Overall, I was impressed at how well the raspberry and Peychaud's worked together flavorwise besides the color coordination aspect; moreover, I enjoyed how the large amount of Peychaud's did not come off as extreme to the palate.